Rockmount is a healthy school! Welcome to our Healthy Schools and School Meals page. Here you will find a wealth of information on healthy living and how Rockmount children are leading healthy lifestyles. You will also find information here about our fantastic Rockmount Learning Kitchen project, our catering company and the current menu. Enjoy a Christmas lunch on Thursday 13th November. At Rockmount, our catering company is called Pabulum and they provide all of our school lunches. Pabulum is one of the largest independent catering companies in the South of England with a reputation for excellent service and fabulous food. They ensure that only the freshest, finest, honestly sourced ingredients are used in their meals. Sometimes the littlest of ladies and gents can be the fussiest of eaters, but this is where Pabulum's twenty years of healthy eating experience comes into its own. They skilfully steam and simmer and sizzle, so even the particularly picky enjoy some goodness at mealtimes. They are passionate about home-grown goodness and our highly trained team of kitchen wizards work tirelessly to cook up a wide-ranging menu of locally sourced, seasonal produce for you and your classes full of hungry tums. Respect for the world we live in is extremely important to us and Pabulum make sure that they take positive steps to minimise the carbon footprint. Pabulum only work with trusted, regular suppliers with a commitment to sustainability. Reception and KS1 children are entitled to free school meals. Helen Carvall and Tracey Langridge attended a Food Flagship celebration at City Hall to celebrate our achievements over the last two years. A webpage has been set up which features two flagship films. There was also a presentation on the day which can be viewed below showing the impact of the Food Flagship work. We have enjoyed planting in our Edible Playground. Reception planted lettuces and Zircon planted onion and chive seeds. We are looking forward to see what happens next! Many of our parents have attended our healthy food events, where some of the school’s initiatives around the promotion of a healthy lifestyle were shared. Stalls included: curriculum information; healthy breakfasts; school lunches; healthy snack alternatives; information from Pabulum and lots more! Please find our school food policy at the top of this page. Healthy Schools - Going for Gold! 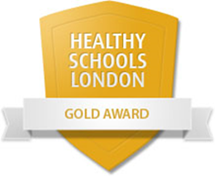 We are very proud to announce that we have achieved the Gold Award for Healthy Schools London. This is in recognition of the work we do to promote health and well being. We have focused on increasing the school meal uptake and the quality of packed lunches. As part of this initiative, Pabulum are now providing a very healthy packed lunch option for children. (more information will follow in the new year) We will also be working closely with Wendy from Phunky Foods and we look forward to providing a range of workshops for parents and pupils. Change 4 Life Take a look at this website for a great app and lots more ideas of how to eat good food and stay healthy.